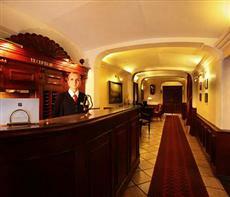 This Karlovy Vary hotel is situated near business addresses. The city of Karlovy Vary is known for its mineral springs. The Hotel Promenada Karlovy Vary is conveniently located in the city. The city is not very large, and tourists can navigate it on bicycles or on foot. This establishment may be reached via rail or bus from Prague, with a travel time of about 3 hours. The Hotel Promenada Karlovy Vary may also be reached via the Karlovy Vary Airport. This establishment offers its guests modern amenities in all of its rooms. Non-smoking options are available. The hotel provides televisions, minibars and private baths in each room. There is room service available around the clock at the Hotel Promenada Karlovy Vary. This hotel has its own wellness facilities located on the premises. Among the services offered by the Hotel Promenada Karlovy Vary are massages, a beauty parlor, a sauna and steam baths. The hotel also offers exercise programs. There is local and international fare available in the hotel’s restaurant. Guests may also arrange various activities around the city through the hotel.